Like the pithy Sinhala proverb, for the United People’s Freedom Alliance (UPFA), it was a case of being gored by a bull after a fall from a tree. It failed to win the August 17 parliamentary elections. It trailed by 11 seats against its main rival, the United National Party (UNP) which secured 106 seats. Thus the formation of a Government was not within the UPFA’s reach. So while for some, joining a National Government and continuing to be cabinet ministers was an attractive proposition, for others, the next choice was to remain in the main Opposition. Those hopes were dashed on Thursday. The new Speaker, Karu Jayasuriya, declared the Tamil National Alliance (TNA) leader Rajavarothayam Sampanthan as the Leader of the Opposition. This was on the basis that he had only received his nomination and there were no others vying for the position. In fact, he announced that the UPFA had written to him saying it was not interested in the post. This caused a fury within the section of the UPFA MPs who wanted to sit in Opposition. Named as Chief Opposition Whip by Sampanthan thereafter is Janatha Vimukthi Peramuna (JVP) leader Anura Kumara Dissanayake. “We had also hoped that President Sirisena would act on our representations but regrettably he has not,” Weerawansa said. The MEP leader told the Sunday Times that it was only after the debate on Thursday that they obtained details of what had happened. That was during a meeting with Speaker Jayasuriya. The Speaker had disclosed the contents of a letter that had been sent to him by the UPFA’s newly appointed acting General Secretary Vishwa Warnapala. In that, he had pointed out that of the 95 UPFA MPs, 82 were from the SLFP. He had declared that the SLFP would not be making any claim for the position of the Leader of the Opposition. That clearly meant there are only 13 MPs from the other parties in the UPFA coalition while the Tamil National Alliance (TNA) has 16. “There is a serious violation of the UPFA constitution. In terms of it, the leader is entitled to replace a General Secretary by appointing another. However, before such a person assumes office, the appointment would have to be ratified by the UPFA leadership,” Gunawardena said. He added “until then, a nominated Acting General Secretary cannot place his signature on any UPFA documents.” He said, “Those concerned should not forget that MPs won the elections on the UPFA ticket and it was the SLFP that has formed a National Government with the UNP. There is a big difference here.” Gunawardena also argued that the post of Chief Opposition Whip should not have gone to the JVP since it held only six seats. In accordance with parliamentary tradition, the office of the Leader of the Opposition should therefore go to the TNA because it had the highest number of seats. “Otherwise, the TNA can argue that it is facing discrimination even in Parliament where it has a right to claim equality,” Dissanayake added. The JVP leader, however, asserted that the UPFA had no right to form a National Government. It has made no such promise to the voters. Only the UNP did so during the election campaign, he pointed out. Some of the recent political issues have been embroiled both in legal and moral arguments. One such instance is the formation of the National Government itself. Senior UPFA leaders have claimed that their MPs contested on their ticket with the Betel leaf as the symbol. Thus they argued the alliance is not a party to such a Government. However, the current SLFP leadership counter this assertion on the grounds that their members constitute the larger component and were therefore entitled to join. More so since the SLFP Central Committee had endorsed a recommendation by the party leader. The Sunday Times then asked SLFP General Secretary Duminda Dissanayake, for his comments on the TNA statement. He said, “The Opposition Leader’s post should be given to the party which has the highest number of members and is not supporting the National Government.” If his remarks were to be taken seriously, that meant that some UPFA parliamentarians were to be allowed to sit in the Opposition. Alas, Dissanayake, quite clearly, does not seem to know what is going on within his own party. Even when he was speaking to the Sunday Times, the thinking at the highest levels was to concede to the TNA request. He was unaware of the moves by his party leader. That was why he rejected outright the TNA plea. Those who argue that one of the 56 UPFA MPs must be given the Opposition Leader’s job now quote SLFP secretary Dissanayake and say he is right in what he said, even if that was not what the party leader felt. UPFA partner leaders spearheaded the signature campaign last Tuesday when Parliament met for the first time. One of them said they were surprised when they obtained 56 signatures. The written request was to be handed over to President Sirisena on Tuesday after he made a policy statement to the House. They had hoped that like on other occasions he would turn up for tea after the delivery of his address. However, there were ceremonial arrival and departure ceremonies leaving no time for a tea party. The question was whether Sirisena ducked the tea party to avoid the dissident UPFA MPs. The letter was thus delivered to Sirisena’s official residence at Paget Road later that day. Before Parliament was convened, an official of the Presidential Secretariat had telephoned UPFA leaders – Gunawardena (MEP), Vasudeva Nanayakkara (Democratic Left Front), Wimal Weerawansa (National Freedom Front) and D.M. Podiappuhamy, leader of the Desha Vimukthi Janatha Party, to invite them for a meeting with Sirisena on Monday morning. Sirisena said he had asked them to come over so he could obtain their views on current political developments. Gunawardena began the conversation by pointing out that there was “still room” for the UPFA to form a Government. Sirisena replied that he did not favour a broad-based National Government since that would be bad for the country. That was why he had mooted a National Government between the UNP and the SLFP. He said discussions were still under way. In fact, when the UPFA leaders wound up their discussion and prepared to leave, walking into the room were Nimal Siripala de Silva, Duminda Dissanayake, John Seneviratne and Anura Priyadarshana Yapa. Talks over the composition of the Cabinet of Ministers were still under way. During the discussion with Sirisena, Nanayakkara was to add to remarks by Gunawardena that Sirisena should look at the prospects of the UPFA forming a Government. “We are not in favour of the UNP,” he said. Weerawansa was to say that UPFA supporters were a disappointed lot and forecast there would come a time when Sirisena would have to think of a Government of his own party. The President was to note that his party would gear itself for victory at the upcoming local Government elections. He made clear that the Opposition should resolve the issue of the Leader of the Opposition. Already gazetted by the Presidential Secretariat on August 21 is an “order to refer the demarcated areas” of the nine provinces of Sri Lanka. This is to facilitate the conduct of polls in different wards under the ‘first past the post’ system. It is in this backdrop that Parliament met for the first time on Tuesday (September 1). Most Sri Lankans were disappointed that they were denied the opportunity of seeing the candidates they selected being sworn in. The two national networks – Sri Lanka Rupavahini and the Independent Television Network – had chosen not to provide live coverage of the morning events. That also prevented other private television networks from joining in for a ‘simulcast.’ That these two state networks often provided live coverage to much less important events was one thing. Here was political history being created with both the UNP and the SLFP MPs taking their oaths ahead of forming a National Government. The only exception was Sri Lanka Telecom’s Peo Television which hooked live the Parliament proceedings from its CCTV cameras. Later on Tuesday afternoon, the state run channels went live for the policy statement by President Sirisena. “…….My manifesto for the last Presidential Election, accepted by the majority of people in Sri Lanka will be the foundation for drafting the agenda for the consensual government to be born through this Parliament. Similarly, the “Panchavida Kriyavaliya” (Five-fold Plan) by United National Front for good governance, “Anagathayata Sahathikayak’ (Certificate of Guarantee for the Future) by United People’s Freedom Alliance and the “Harda Sakshiye Sammuthiya” (Agreement of Consciousness) by Janatha Vimukthi Peramuna as well as the election manifesto of Tamil National Front have been studied in comparison with the policy frame based on the principles of Good Governance presented in my manifesto; ‘A Compassionate Maithri Governance – A Stable Country’. Accordingly, I will take action to establish policies in the new consensual government by mixing the policies of other parties incorporated into the future vision identified in my manifesto……. On Thursday, in Parliament, Prime Minister Ranil Wickremesinghe moved a resolution titled “Determination under the Constitution of the Democratic Socialist Republic of Sri Lanka.” It said; “Whereas the United National Party which obtained the highest number of seats in Parliament has formed a National Government, Parliament determines in terms of Article 46(4) of the Constitution of the Democratic Socialist Republic of Sri Lanka that the number of Ministers in the Cabinet of Ministers shall not exceed 48 and the number of Ministers who are not Cabinet Ministers and the number of Deputy Ministers shall not exceed 45.” This was in effect seeking approval to increase the number of Ministers and Deputies in accordance with the 19th Amendment to the Constitution. Premier Wickremesinghe said that the UNP had signed an agreement with the SLFP to form a National Government. Their programme is based on consensus and those who like to join it can obtain ministerial positions and others could participate in Oversight Committees to strengthen governance. JVP leader Anura Kumara Dissanayake who sought a debate on the motion earlier declared that the mandate President Sirisena received on January 8 was not to increase the number of ministers. He argued that the subjects allotted to ministries should have been stated in the motion together with the different portfolios. Not many were aware that by noon, when the debate was under way, SLFP General Secretary Duminda Dissanayake had sent out a directive to party MPs that the whip would apply. In other words, he was telling them that voting on the resolution was compulsory. After a lengthy debate where several MPs from different parties took part, it was put to vote. Those voting in favour of the resolution were 143 while 16 opposed it. The Tamil National Alliance (TNA) MPs staged a walkout at voting time. That included Selvan Adaikalanathan who had been named the Deputy Chairman of Committees. Two parliamentarians – Malik Samarawickrema and Ali Zahir Mowlana, the Sri Lanka Muslim Congress (SLMC) MP who contested from the Batticaloa District on the party ticket- were absent. With the exception of Speaker Karu Jayasuriya, that would bring the number of UNPers who voted to 104. That means 39 votes came from the Sri Lanka Freedom Party (SLFP). This is less than half the SLFP’s strength in Parliament. The others had chosen not to be present at voting time. That was in clear defiance of the whip that was issued. This is notwithstanding the fact that the SLFP General Secretary has sent out a directive. Did they choose to ignore the directive and will they face disciplinary action? “We have signed an MoU with the SLFP. It is up to them to deliver on their part,” said an angry senior UNPer who did not wish to be identified. He said they have failed to do so though the resolution was adopted, he added. Similarly, amidst contradictory positions by different leaders of the SLFP, what will become the fate of 56 UPFA MPs if they chose to remain in the Opposition, as Weerawansa claims, functioning as “Independents?” For Sirisena who leads both the UPFA and the SLFP, the tasks would no doubt become high priority. Sirisena chaired the 64th annual convention of the SLFP at Kaduruwela in Polonnaruwa on Wednesday. In what seemed a strange turn of events, Mahinda Rajapaksa also turned up though Sirisena did not want him to contest the August 17 polls but later relented. The organisers, particularly SLFP General Secretary Duminda Dissanayake and Seshala Jayaratne, member of the North Central Provincial Council, were aware that Rajapaksa would attend. They had packed the foreground of the stage with Sirisena supporters. Dissanayake was delivering the welcome speech when Rajapaksa arrived. Sections of the crowds began to cheer him prompting the SLFP General Secretary to say that the former President was also welcome. Dissanayake had been a notable absentee when Rajapaksa held the UPFA’s inaugural election rally in Anuradhapura in July. 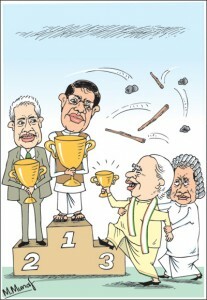 If some on the stage rose, Sirisena remained seated. Rajapaksa greeted them all and took a seat next to the President. Then Dissanayake was to declare that there were no two leaders and assert that only Maithripala Sirisena headed the party. Sirisena declared that all those present at the previous 63rd annual sessions were there in Polonnaruwa as well and that boded well. As the sessions ended, factions supporting Sirisena gathered at his Polonnaruwa residence. Rajapaksa and his supporters met up at the Deer Park Hotel and other groups in different hotels in Polonnaruwa. At Sirisena’s request, all liquor bars in the Polonnaruwa District were closed on Wednesday. This was to see heavy business for a liquor store at the Habarana Junction where parliamentarians had stopped with their supporters to obtain stocks. There were others at the nearby rest house. “….This time the Prime Minister and I have decided to have a committee to scrutinise these appointments. Persons will be selected to the posts in keeping with their qualifications and according to requirements. The Ministers are hereby informed that they should make these appointments according to the recommendations of the Committee. The ministers can submit their requests. The requests will be taken into consideration and the appointments will be made in consultation with the ministers. The move, quite clearly, has been prompted by some Ministers appointing their relatives, sometimes unqualified, to official positions. Besides his responsibilities as the Executive President of Sri Lanka, Maithripala Sirisena has opened up several new fronts. He is busy consolidating his position as leader of both the SLFP and the UPFA. A section has already defied the whip of the SLFP’s General Secretary and avoided the vote on the resolution moved by Premier Wickremesinghe. Now, he has forged a National Government and sworn in a team and is set to oversee day-to-day governance. Even if some powers of the Executive Presidency were shorn through 19A, that the holder of such an office still wields tremendous clout is confirmed by the political events in the recent weeks. Thus, a great challenge lies before Sirisena. He has to make good the pledges he made to the people, his party, the UPFA, to a new Parliament and a Cabinet of Ministers. This is while ensuring that the pledges he made during the presidential election campaign to deal with gigantic corruption and misrule are not abandoned midway. Thou too Sirisena: The Rajapaksa way in New York? Will the Colombo Consensus spur economic growth?